The following screenshots give you a feeling of the program look and functionality. The latest version of the program can be always downloaded from the Download section on our website. 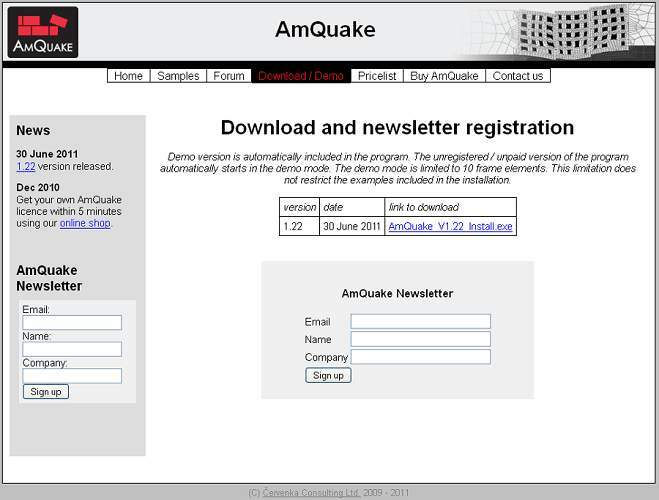 If you are interested in receiving the latest news about the program development, please register for our AmQuake newsletter. During the installation you can select your local language. In order to exploit the full functionality of the program, the registration and payment of 390Euro is required. The registration is done through the corresponding item on the program menu. There you fill in your company name and the license number that you can purchase through our on-line electronic shop. 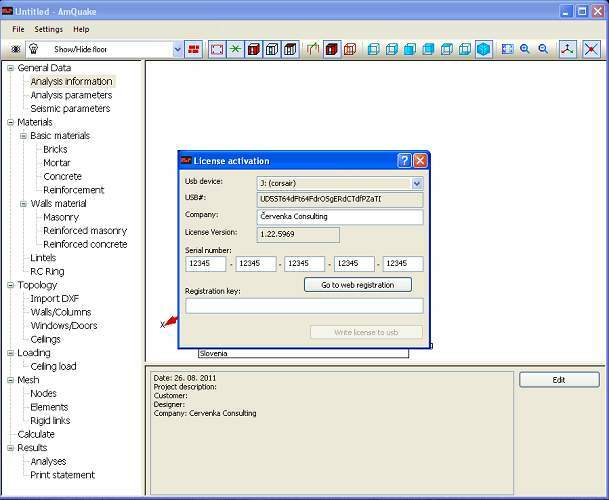 The program stores the license information on a USB memory stick of your choice. The program is then fully functional on the computers, where the program is installed and the registered USB stick is attached. The program AmQuake is translated into 14 languages: Bulgarian, Bosnian, Czech, English, German, French, Greek, Croatian, Italian, Hungarian, Romanian, Slovenian, Slovak and Serbian. 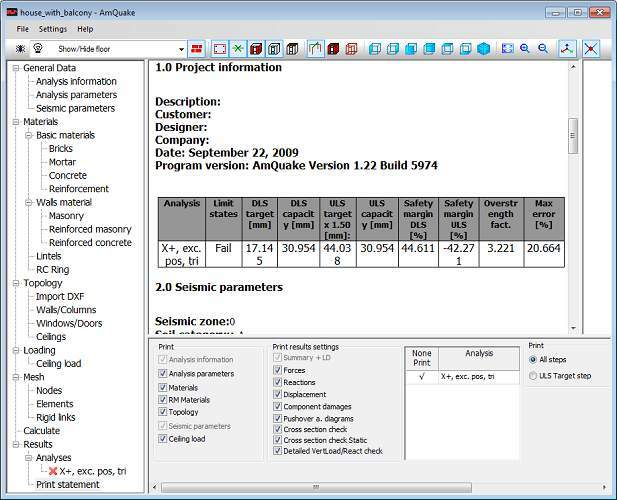 The program AmQuake includes a database of products and national building standards for the following countries: Austria, Belgium, Bulgaria, Croatia, Czech, France, Germany, Hungary, Romania (CR6 and P100), Slovak and Slovenia. The other countries are under preparation. When you create a new project, you can select which national building standard you want to use, then all the paramaters for the selected standard are automatically activated and used during the seismic assessment. When a new project is created, it is usefull to include some project description. The next step is to define various global project settings such as: building importance class and check the safety coefficients for the analysis. 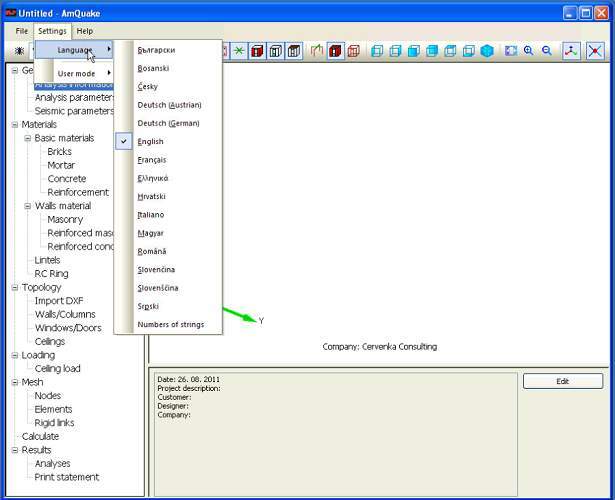 The next dialog is used for the definition of seismic demand such as the seismic zone, reference peak ground acceleration, soil category, and other parameters of the elastic response spectra for the pushover analysis. 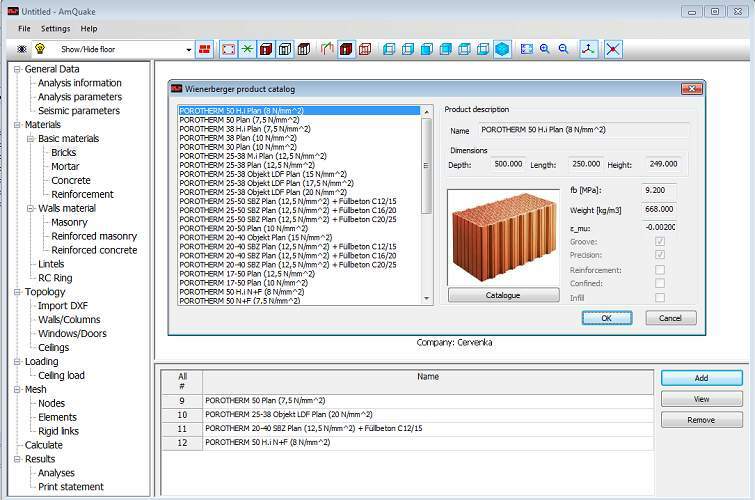 The program includes an extensive list of Wienerberger brick products for the selected country along with all calculation parameters and product sheets. The program enables the definition of several type of wall materials: unreinforced masonry, reinforced masonry, confined masonry and reinforced concrete. In addition it may be necessary to define the arrangement and materials for the reinforced concrete rings in the ceiling or lintels. 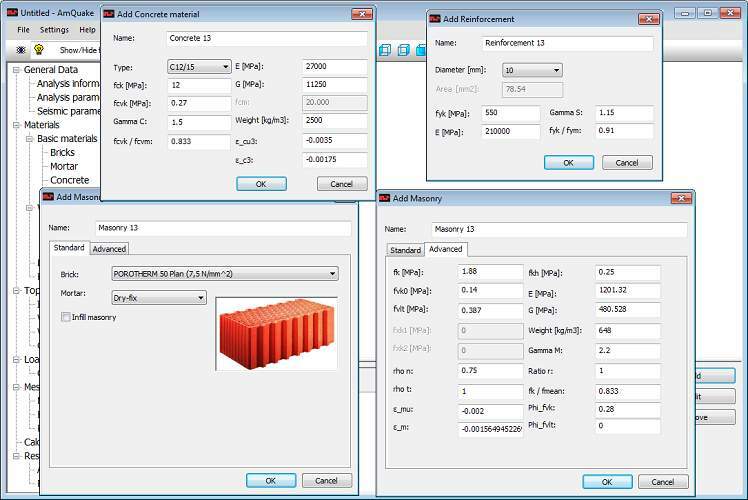 The input of all material parameters and properties is easy to define and user intuitive. The creation of the building model is very straightforward, and direct import of DXF data from your favourite CAD program is possible. In your CAD program, it is just necessary to create special layers, where the location of structural walls and windows is indicated by simple marks. 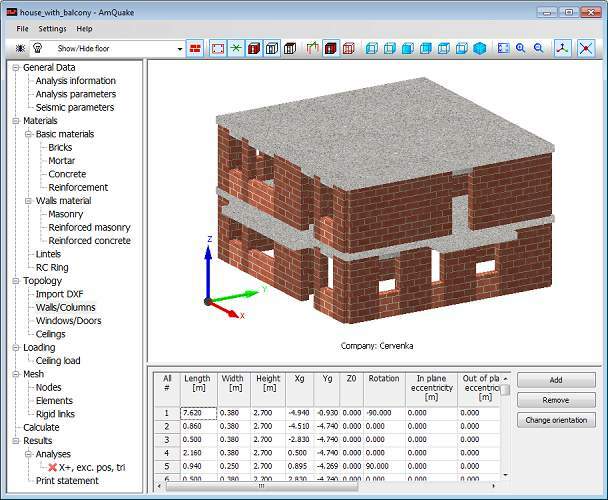 The program automatically detects the wall dimensions, and if needed asks you to select a suitable brick type or material. In few minutes, a complicated building model can be generated. The main geometrical entities are walls, windows and ceilings. It is possible to selectively display individual floors, windows or walls. If needed, the individual entities could be modified, added or removed. 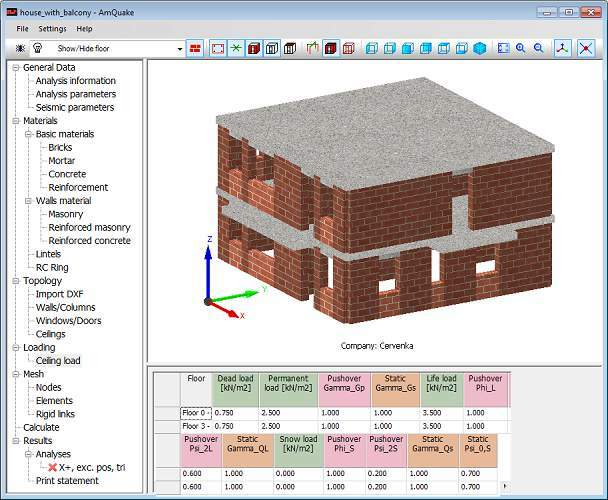 The program enables a user definition of load distribution to the individual walls. 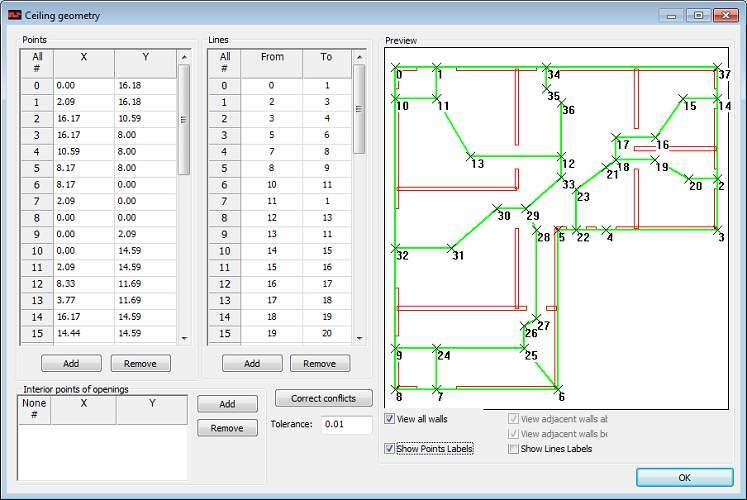 This is facilitated also by defining a special layer in the DXF file that includes the load distribution areas. 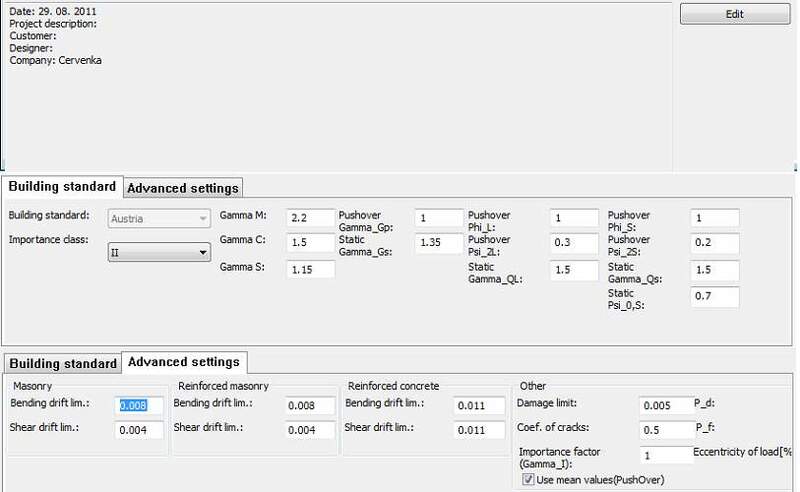 With this method it is possible to model different statical systems of the ceiling slab or deactivate certain parts of the ceiling to model staircases or other openings. Each ceiling contains a definition of dead load, permanent load, life load or snow along with the corresponding partial safety factors that are automatically filled in based on the national standard, but can be modified if needed. 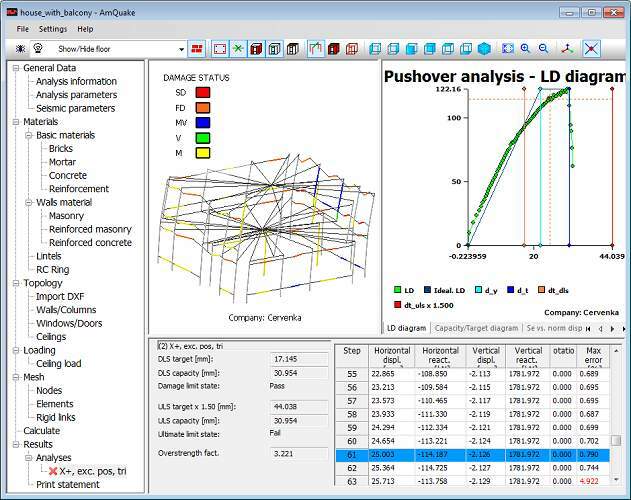 For the model calculation, it is necessary to create a suitable finite element model. 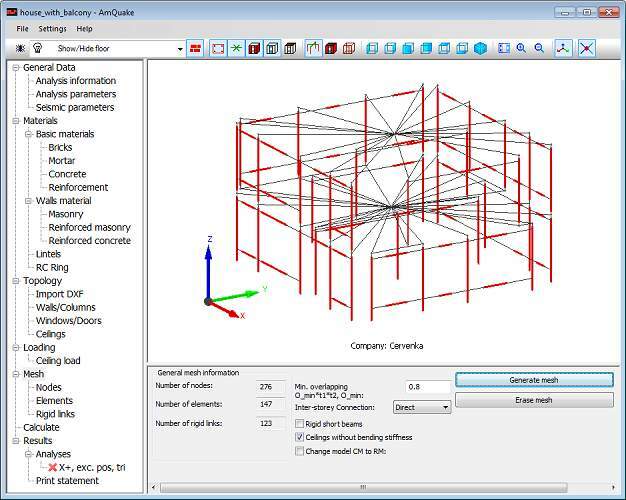 The AmQuake model is based on the equivalent frame method and it is created fully automatically, but advanced users can modify the manually. 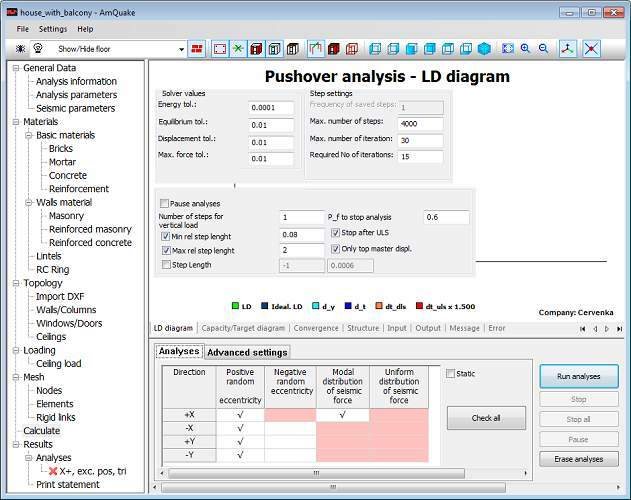 This dialog controls the parameters for the pushover analysis of masonry buildings based on Eurocode 8. Here it is possible to ask the program to perform standard static checks of the vertical walls. 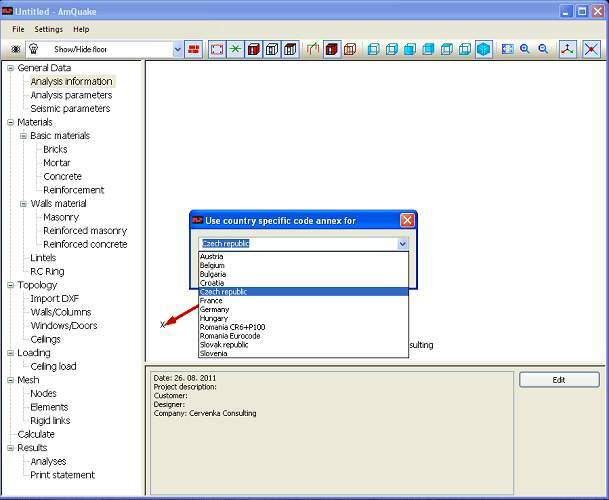 The program includes many features for postprocessing of results from the individual analyses. It is possible to display a final failure mode of the structure as well as the failure modes of the individual walls. The masonry wall sections are checked using Eurocode 6 formulas or CR6 in Romania. The reinforced concrete sections are verified using the Eurocode 2 rules. 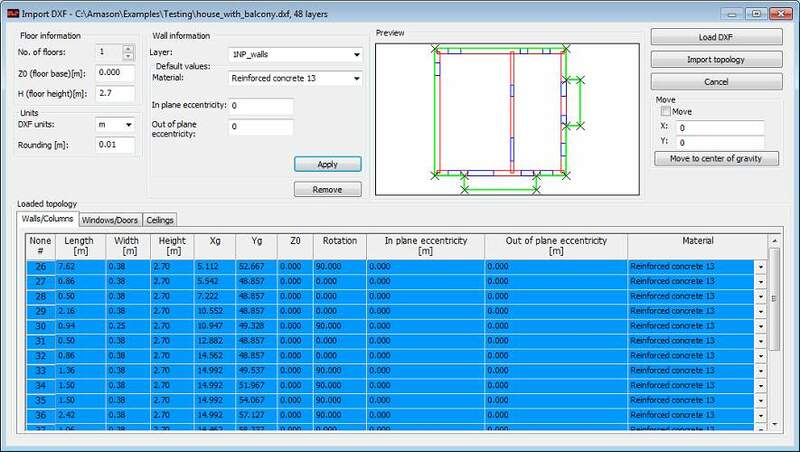 The results of the seismic evaluation according to Eurocode 8 can be printed into a rtf protocol, which can be directly used for the building permit process. In just a few steps your building is verified using modern seismic assessment method in accordance with Eurocode. 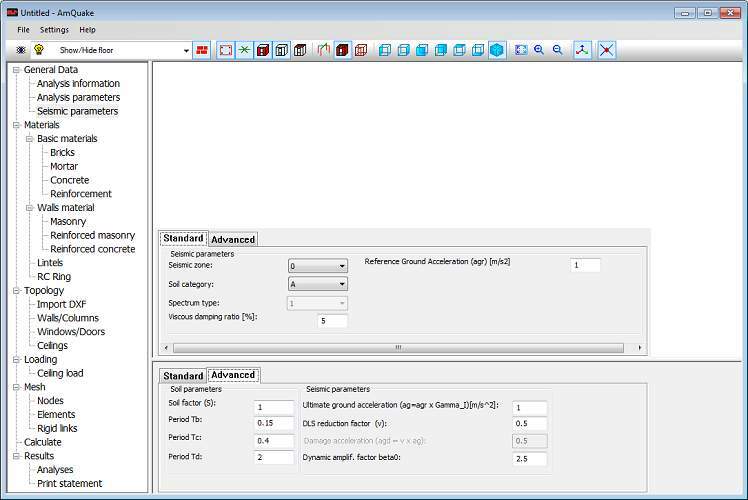 If you want to have a closer look at the program handling and its unique features, please go to the Download section and try the program demo version.